Need some fish bait, a fishing license or a boat launch permit? Try these Sheboygan area tackle shops and stores. Be sure to tell them the "Sheboygan Fishing Guy" sent you! Winter/ Mon. Closed, Tues. - Fri. 6a.m. to 6p.m., Sat. 6a.m. to 4p.m., Sun. 6a.m. to 12p.m. A Sheboygan fishing landmark for over 50 years! I've been going to The Wharf for my fish bait since I was a little kid. I stop in regularly to get my bait and fishing tackle when I fish the North Pier or Marina. You "must see" all the mounted trophy salmon and trout caught in the Sheboygan area that surrounds their shop walls. While your there, buy a T-Shirt from your favorite Sheboygan charter boat. 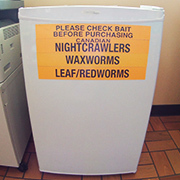 Get Night Crawlers, Worms, Leeches, Shiners, Fatheads, Spawn Sacs, frozen Alewife and Herring strips. They also make and carry "JEFF's TACKLE", high quality Great Lakes fishing tackle. 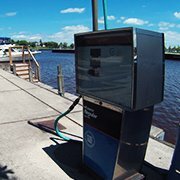 Need fuel for your boat? They have it at their riverside boat dock. The Wharf is famous in Sheboygan for smoked salmon and trout. They'll smoke your fish during the summer and for the holiday's. They also have full service fish cleaning. So bring your fish in and have them cleaned and smoked. The Wharf is home to the Junior Coho Derby, Powder Puff Derby and Coho Derby. Looking to do some Lake Michigan charter boat fishing? 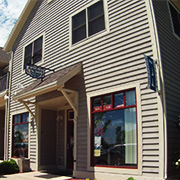 Stop in or give them a call to book a local Sheboygan charter boat. Hours: Mon. - Thurs. 9a.m. to 6p.m., Fri. & Sat. 9a.m. to 6p.m., Sun. 9a.m. to 3p.m. I go to Anglers Avenue for my fish bait and tackle when I fish the South Pier area. 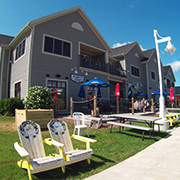 They also have a nice Pub & Grill next door with a beautiful outside patio area for eating along the Sheboygan Riverfront. 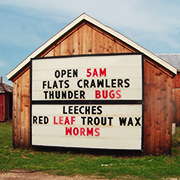 Get your Night Crawlers, Worms, Spawn Sacs, Shiners, Fatheads and frozen Alewife here. They also carry my favorite salmon and trout fishing lure, the Luhr Jensen "Cast Champ" (Mr. Champ), spoons, lures, tackle, dip nets, rods and reels for pier fishing, inland fishing, and rigs and tackle for Lake Michigan trolling. Anglers Avenue has fishing pole rentals for $10.00 a day and a boat dock out back you can fish from or park your boat to eat at the Pub & Grill. Looking to hire a Lake Michigan fishing boat charter? Stop in or give them a call to book a local Sheboygan charter boat. Hours: 5a.m. to 6p.m. Daily. Call, might be open after 6p.m. 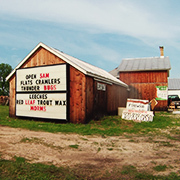 Best selection of live fish bait in Sheboygan, County! I make the quick drive from Sheboygan to Terry's Bait Bucket to get my live Suckers for Northern Pike fishing. 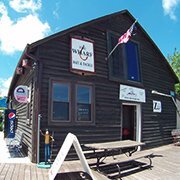 They also carry a nice selection of Walleye fishing tackle as well as other inland fishing tackle..
Terry's Bait Bucket has Night Crawlers, all types of Worms, Leeches, Thunder Bugs, Suckers, Shiners, Fatheads, Rosy Reds and other types of seasonal bait. They also carry frozen bait like Crayfish tails and Smelt (Biggest Smelt I've ever seen!) Give them a call to see if they have what your looking for. 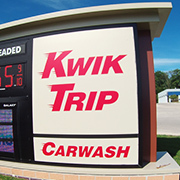 I stop at Kwik Trip to get my fish bait when the other bait shops are closed or just for the convenience. They do not carry any fishing tackle or fishing licenses. They have Night Crawlers and several types of Worms.